One of the many things I appreciate about having friends of diverse race and ethnicities is the cultural exposure that I have come across. Last weekend, my roommate invited me and our other roommates to attend her sister’s Quinceañera celebration back in her hometown. We arrived a day before the ceremony to help set up for the event. Once we arrived to the reception hall at the hotel, the room was filled with relatives and close friends of the young girl, soon to be a woman. After decorating for a few hours and eventually being told to leave the hall since it was already past midnight, we were able to catch a few hours of sleep before things got very hectic the following day. Quinceañera is a coming of age celebration of girls in the Hispanic culture that recognizes that a girl is considered a woman once she turns 15 years old. On the morning of the Quinceañera, the first component of the celebration was family and friends attending the church ceremony. Although a couple of us could not attend the church service because we were exhausted from the previous night, we were told by our roommate that during the church ceremony, the quince girl would traditionally kneel in front of the priest on an elegantly decorated pillow to show her dedication to God. After the church ceremony had finished, everyone returned home to prepare for the actual ceremony that is to take place in the evening. What Happens During the Preparation for the Quinceañera Ceremony? During the preparation for the ceremony, the quince girl and her Quinceañera Court of Honor, which is comprised of young girls (Doma) and young boys (Chambelán) who coordinate with the quince girl. The quince girl usually wears a princess–like dress with dramatic details made of rhinestones, almost emulating a Cinderella dress style. Her accessories include a tiara, a bible or prayer book, a cross or medal. 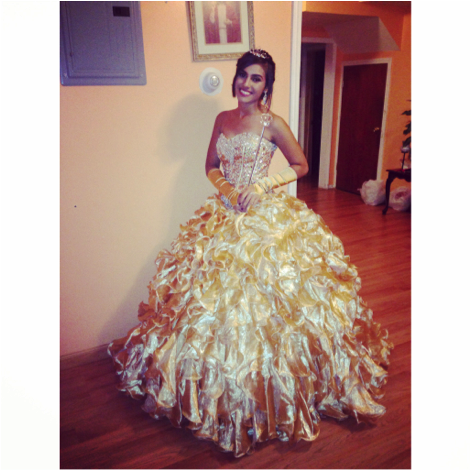 The traditional clothing of the Quinceañera Court of Honor Her is made to complement the quince girl and the theme of the ceremony. After hours and hours spent on make-up and hair, it is time for a billion photos to be taken at the house and, FINALLY, it is time to go to the reception hall and celebrate! What Takes place during the Quinceañera Ceremony? At the reception hall, this particular celebration began when the quince court is introduced to the friends and family attendees and then the quince girl made an entrance with her father. 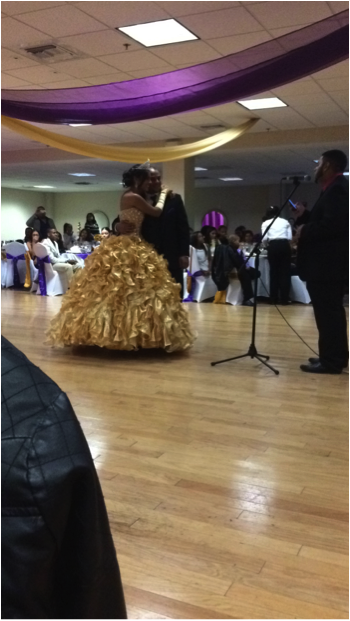 The father escorts the quince girl to the “throne,” where he changes her flat shoes into high heels. This is a symbol of her leaving her childhood stage and stepping into adulthood. The quince girl is then presented with a tiara by her mom, which “denotes a ‘princess’ before God and the world; a triumph over childhood and ability to face the challenges ahead” (see Quinceanera Boutique link). Immediately after that, the quince girl took a walk around the reception hall, showing off her new shoes and tiara presented by her parents so that everyone can admire and appreciate the meanings embedded in those accessories. The real party begins once the quince girl and her father share a dance together and eventually everyone is encouraged to step onto the dance floor and dance. If there were one or two things I took away from attending the celebration, it would be that although it is a celebration of a girl transitioning into a woman, it was also celebrating the parents who have raised her thus far to be the girl/woman she is today.